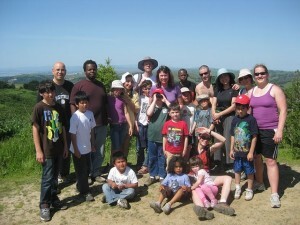 Sensei Molly O’Rourke led a group of about 20 dojo members, family and friends to scale Wildcat Peak in Tilden Park in celebration of Earth Day on April 25. The group of explorers enjoyed discovering turtles and other reptiles, birds and wildflowers during the hike and learned to appreciate the danger of poison oak, which was all too abundant. Reaching the peak was a challenging and sweaty task as temperatures reached a toasty 80 degrees. The hikers were rewarded with a variety of treats at the top, including trail mix, fruit and salami slices. Devoted judo students Taka and Tomo showed off their lighter side by creating the unforgettable sight of edible jewelry (or wearable food), turning salami slices into bracelets. As an added plus, the jewelry left their hands and wrists shiny and moisturized. After giggles, photos and admiration of the view from the peak, the group trundled down the hill with a new appreciation for the importance of packing enough water on nature hikes.